So I slept (because I was really jet-lagged) and woke up just in time to get ready for a business meeting which was an hour before the first show I've RSVP-ed to! Imagine the horror. So I wore this in the mad rush and thank God I was ready for KLFW by just throwing a cape on the blouse. 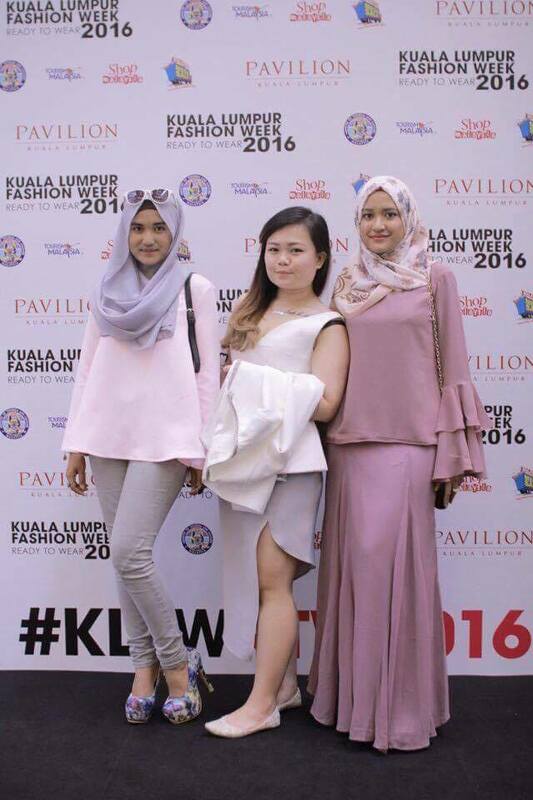 Of course, at KLFW you change 3 BILLION times according to the designers. So for my second look, I wore a Melinda Looi satin bolero. To be honest, I have no idea what colour this is but it's my favourite jacket ever. It looks professional and classy and fashionable at the same time! After the show, I hadn't the time to mingle because I had to change to a Mimpi Kita outfit! I had this dress since 2013, I think. It was my favourite for dressing up. Because at that time, I was no fashion blogger and that's like the only designer anything I had. Haha. On Saturday (the fourth day of KLFW), I woke up late and did not make it for breakfast with Ashman. Because I had my monthly you know. And I was in so much pain at that time, I couldn't even think about clothes. I just wore whatever I saw first. And decided I couldn't give two hoots. I wore my makeup in the car while my sister drove. In fact, my second outfit was something she took. She even ironed my shawl for me. BEST SISTER EVER! I didn't change much for my second look. Just the top. I wore a sweet flirty look. And I made a new friend! My final look for the day, I chose a no-need-to-iron outfit from When Our Eyes . Yes. I cheat. And this is something everyone needs! I actually brought this on my travels. It's so easy to wear and I swear it blends in with the Europeans. I did not feel out of place at all in Paris. My sister tied my turban for me. It's some instant turban my mom bought years ago but none of use knew how to wear it (I still don't know how to tie it myself) but thank God my sister is a life saver! I also have to thank Penny, my fashion designer best friend since high school, for the purple lipstick because it really went well with the look! 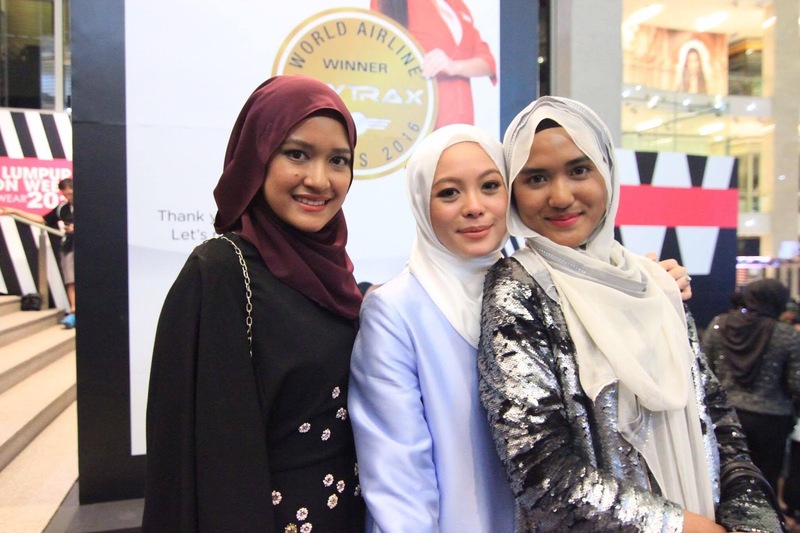 On the final day of KLFW, I was still jet-lagged and was in a mad rush. But as it was the final day, I met more familiar faces. My favourite moment is when my sister and I met Magdeline Wang Si Kar, a.k.a. Maggy Wang, the Fly FM Radio DJ and Miss Malaysia Universe Finalist. Mag (as we've always called her) is my sister's best friend from high school. They were sat next to each other in Form 1 and were inseparable ever since. We used to have sleepovers and all of us were in the choir, so we're always hanging out. And I've always been the penyibuk little sister. LOL. Anyway, at the finale, we met and were like telling each other how proud we were of each other because all of us are a long way from where we were! It was so fun catching up with friends from all walks of life! From school, from college and from the fashion world itself. And it was indeed an honour to have been invited to KLFW 2016.
tak sahih kalau tak kak suzai tu.